Officers: John Cullingford, Ken Cook, Dave Harding, Martin Rhodes, Andrew Todd, Sean O'Brien. 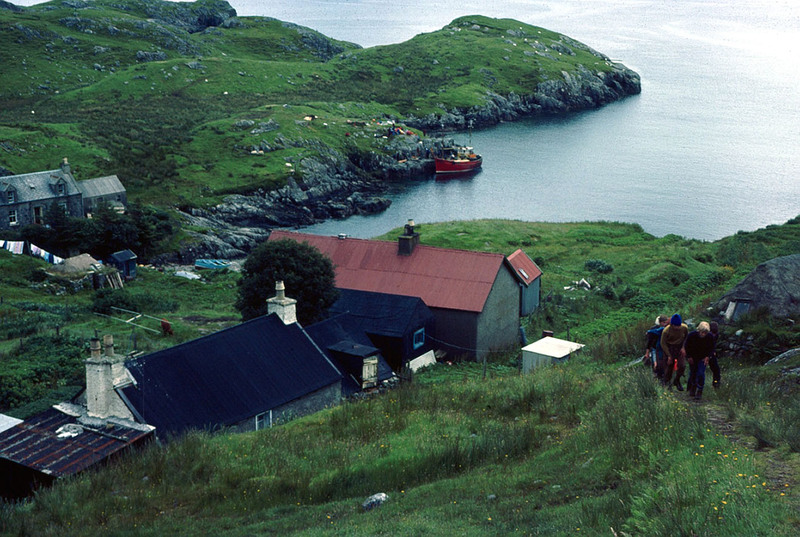 Long ago - or so it seems....But to look at the photographs recaptures instantly the atmosphere of the rocky, green wetness of the resilient Rhenigadale inhabitants of those heady days when we did lots or merely forgot our excuses for not doing much. A scattered miscellany of memories which recur at will or when least expected. Harris is a unique setting, even on the enchanting Hebrides, different. We were able to sample so many facets of the island...the wild ness of the campsite and its scope for activities, the sporadic weather (No, not rain - just liquid confetti!]. A good number of us managed to get to the strikingly different Luskentyre area on errands as various as sand-dune photography, bird study, and to sample plant foods. 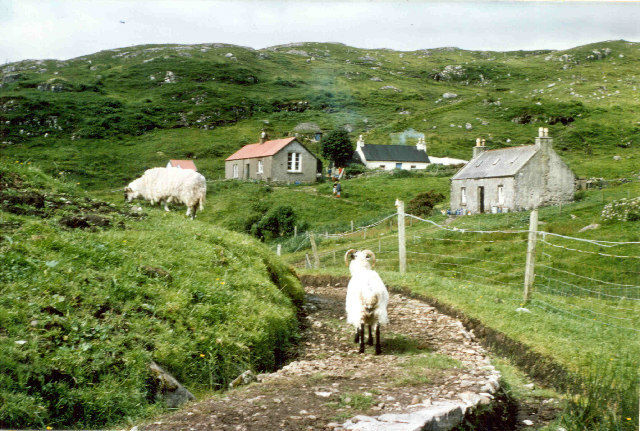 Most of us sought further practice on the Scriob (Zig-zag) footpath to Tarbert, whether on the bread-run, or en route for the Tarbert Games or the weaving visit. 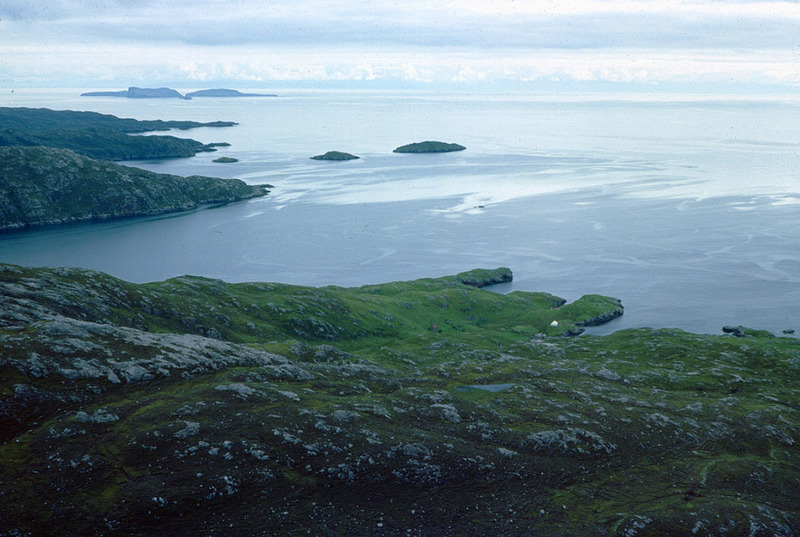 The strenuous hill walking around the site was obligatory, whilst the Clisham trek,-of disputable distance and hazards, was open only to the 'Hard Bunch", led (from the rear) by Ken and John C. The canoes were well used on brief forays, but most successfully on the open water: over to the deserted settlement of Moliginish with its haunting, atmospheric ruins, and on to a twelve mile round trip up Loch Seaforth to plant the S.H.S flag on Seaforth Island (at beach level, I must add), to the accompaniment of sea-water seasoned Jam sandwiches and damp matches. The brightly helmeted climbers scaled the few faces near the site with enthusiasm and skill. The weather tested us a fair bit, demolishing some tentage in one assault. Despite this, the study work was pursued doggedly. John Chasemore went to inordinate lengths to study seashore plant and animal life, often donning snorkel and mask whilst the rest of us shivered to watch. Phil Jones fitted a rock study project in whilst involved in most other activities too. Alun Lloyd and Dave Perritt put into practice an idea for a survival shelter. -Ian Carr, amongst many other things, studied fish anatomy fairly regularly. Michael Tonkin amazed us by his ability to interpret the local scene in his sketches. And so much more besides. 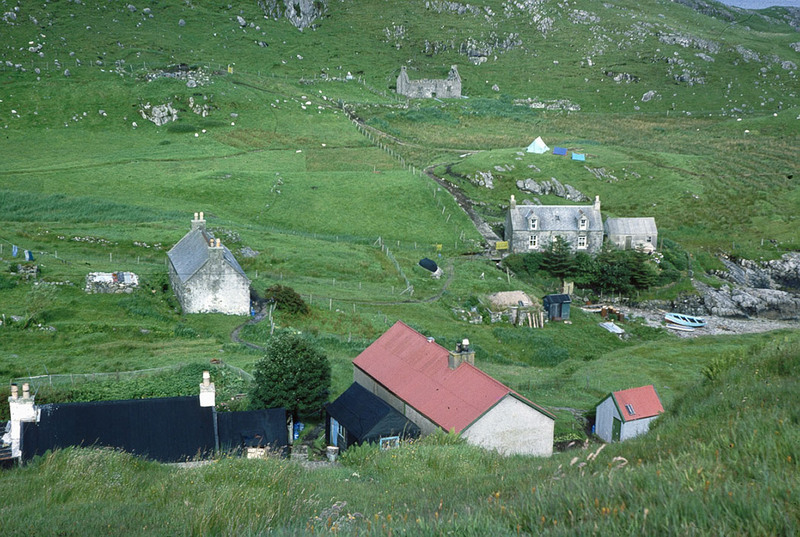 The photos below were kindly sent in by Ian Mitchell who, although not a member of the S.H.S himself was staying at the Gatliff Trust hostel at Rhenigidale for some of the time that the S.H.S were there, and indeed, the tents visible in the first two photos are the S.H.S campsite and the 3rd picture shows the equipment piled up ready to be collected by the boat. The people on the path out of Rhenigidale are S.H.S members. Also included at the bottom of the page is a link to a pdf with extracts from Ian's diary and some photos of the residents of Rhenigidale, in it he mentions being invited to the last night 'bash' in the marquee. Hopefully at some point in the future someone will contribute more to this page. Martin Rhodes recently got in touch (22/01/2015) and he will hopefully dig out some more content when he gets time.